In the early 1900s during the automotive boom there were literally hundreds of different automobile manufacturers and models of cars. You wouldn’t know that today and it’s hard to rattle off more than a dozen because many of these car companies went under or were absorbed by other manufacturers and their models released into production under a different name. The Wisp Nasal CPAP Mask from Philips Respironics Coming Soon! I can relate this to the CPAP mask market by telling you there are many manufacturers developing new masks on the global market but have they missed the boat? Are the new masks coming out going to be obsolete or absorbed by the top 3 CPAP manufacturers? It’s hard to say how long they will be around but we are noticing a trend with the manufacturers to evolve into fewer platforms and designs of CPAP masks and streamline it to 3 style models; nasal, nasal pillow, and full face. I speculate the market will be heavily weighted between only 2 of those options, the nasal pillow mask and the full face mask. Nasal pillows are controlling the nasal interface market right now. Not only are they more comfortable but there is much less to them to cause irritation plus cleaning and maintenance is a breeze. The Respironics WISP headgear resembles a nasal pillow style and the cushion is small and lightweight. If anything, I would call it a nasal/nasal pillow hybrid. This may be just the angle Respironics is taking with the mask. We have seen extremely lightweight masks released from their competitors such as the ResMed Mirage FX and The Fisher Paykel Eson, however the WISP headgear makes me wonder if it may be better (we’ll let our customers be the judge). 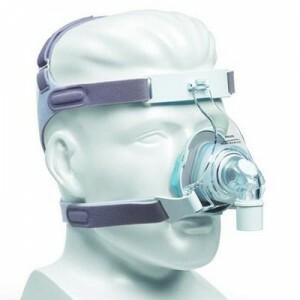 We were very excited when Respironics released the True Blue nasal CPAP mask, not because of the design but more for the anticipation that they would come out with a mask that could rival the quality of the ResMed family of masks. It’s not uncommon for us to see many prescriptions that are brand specific for a Respironics CPAP or BiPAP machine to be used with a ResMed CPAP mask. The True Blue buzz wore off quickly and it’s hard to say if it was the quality of the mask, the fact that it was not prescribed by physicians very much or that the nasal mask interface market is completely saturated by too many mask options. Will the WISP follow in the footsteps of the TrueBlue or will give Respironics that edge to gain market share on nasal style masks? In closing I would like to tell you to check out our mask comparison chart and reviews currently being developed, this just may help you decide which CPAP therapy interface you might want to try.